The following report is echoed across the UK mainstream media. 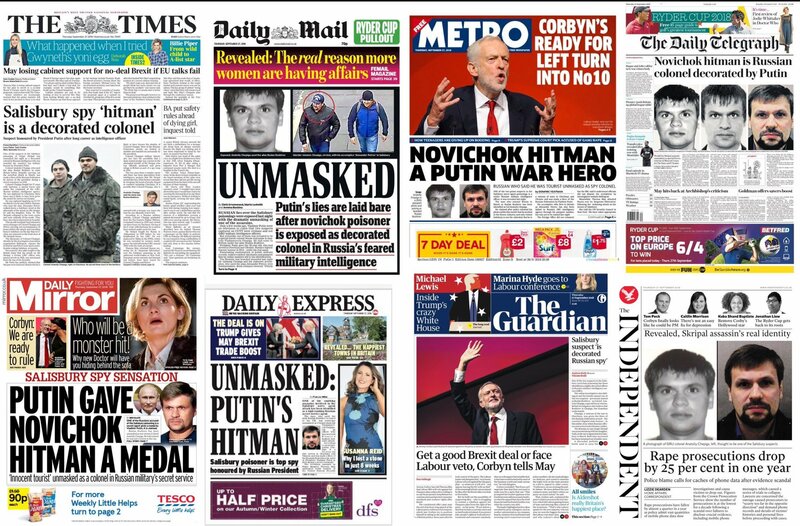 In fact it is on the front page of most major UK newspapers this morning and essentially it relates how one of the alleged Skripal “assassins” has been identified as an officer in Russian military intelligence. Or so we are led to believe. Closer scrutiny reveals that this information originates from one of two online investigative sites. One of which, Bellingcat, is thought to be funded by British Intelligence. In other words the following “news report” is being brought to you directly by British intelligence. The main British organisation involved in the current face-off with Russia and which has a deeply vested interest in how the public perceives that face-off. One of the two suspects in the Salisbury novichok poisoning has been identified as a highly decorated officer in Russia’s military intelligence service (GRU). The online investigative sites Bellingcat and the Insider uncovered information identifying one of the two suspects – previously named as Ruslan Boshirov – as Col Anatoliy Chepiga, a special forces veteran. British investigators also believe one of the pair is Chepiga, the Guardian understands. Chepiga, a veteran of the war in Chechnya, was awarded the country’s highest state award, hero of the Russian Federation, in December 2014 when Russian officers were active in the Ukraine conflict. The Russian ex-spy Sergei Skripal was poisoned along with his daughter, Yulia, in the nerve agent attack in Salisbury in the UK in March. Both later recovered but have remained out of public view. A discarded perfume bottle used to carry the poison caused the death of one woman who came into contact with it, Dawn Sturgess and injured her boyfriend, Charlie Rowley. The two suspects – Boshirov and another man named as Alexander Petrov – have been charged in the UK with attempted murder and conspiracy. The naming of Chepiga eviscerates claims by the Russian president, Vladimir Putin, that the two men are civilians and have no links to Russian state intelligence.